In Copenhagen, my friend and I pass the Hotel Astoria, a building of rectangles stacked upon rectangles with wrap-around windows, a distinctive thin column on top adorned with wings, and a greened-copper crown. At first I feel renewed wonder at the strange and remarkable architecture of the Danish capital. But my mind quickly jumps to the other Astoria – the one in Queens: a neighborhood where I experienced, unexpectedly, a fleeting but exhilarating love, the kind with the power to wake you from a long and apathetic slumber. There are many ways to think about New York when you’re not there, and many small details that can trigger accidental memories. When I’m away and think about the city in the most general sense, I find my mind doesn’t wander to one of the many apartments I inhabited in East Harlem or Clinton Hill, nor to any of my usual haunts. Strangely, it’s always the intersection of Houston and Second Avenue that comes to mind, that chaotic place where Second Avenue is split into Christie and Forsyth – streets whose names I admittedly never can remember. It’s a messy intersection of odd permissions, to turn or not to turn, and it leads to places I treasure: towards the Manhattan Bridge that bends over to touch Brooklyn, under the bridge to dim sum at Palace 88, or to the Sunshine movie theater with its many stairs. I also see the corner over time: before there was the Whole Foods, before Mars Bar was erased, when I crossed it by foot, when I started to bike. Leaving New York has been almost accidental, and might even appear sly. At the time, my departure seemed to demand a small see you later, not a definitive goodbye. Only for four months, I said, to get some fresh air, spend some time at home, save some money, get some writing done. But I was well aware that it might be more time away, even if I didn’t know exactly how or where or under what circumstances that additional time would be conjured. Now, thinking of the city stirs up not only the regular nostalgia of a New Yorker far away, but an unwitting ode of goodbye from one who knows that a more definitive departure is almost certain – and has perhaps already happened. An attempt, like this one, to write an homage from a distance instead becomes a wistful farewell letter. It feels strange to be thinking of leaving a city where I haven’t lived for months. My things are there, inanimate appendixes of my existence, neatly stowed away for my kind subletter, waiting to be moved out permanently – and soon. Twelve years nevertheless. Maybe fewer if I count the necessary escapades out of town to make the city bearable when the deep raspy drone of the subway and the constant rush of people and cold wind tunnels became too much to bear. A dozen. Like eggs in a carton. Like the months in the year. Doce años no se fuman en pipa. Twelve years don’t go up in smoke. New York is the tail end of my teens and the whole of my twenties, neatly, in a bow. It is all the beds I’ve slept in, eight apartments, two relationships, and a flurry of hopeful, fleeting dalliances. It is university degrees: two. It is concerts, shows, meals: too many to count. It is learning the cozy joys and frictions of cohabitation. New York in birthdays: twelve – always freezing, always on Valentines Day, sometimes a curse. So many impressions, layered over others. New York as a fresh-faced eighteen-year-old, when the distance from Washington Square Park to the Lower East Side would have seemed insurmountable if not for the lure of bars that weren’t carding minors. I’d come from Panama, where the aspirationally-named Plaza New York or New York Bagel Café bore no promise of what the real thing would be like. Carding: a word so casually thrown around in that other decade and not much part of my vocabulary these days, not since I’ve pierced my thirties. Just like other early New York words: dorm, dining hall, sketchy. Sketchy: the first word I learned in the freshman dorm, from an American boy named Kyle at a time when being from California or Chicago still seemed to make no difference. The second word was douchebag. With time measured in technology and software, New York when it began for me knew neither iPhones nor Instagram. Facebook had barely made it onto the scene and I thought it was a book – a real book – with people’s pictures pasted inside. 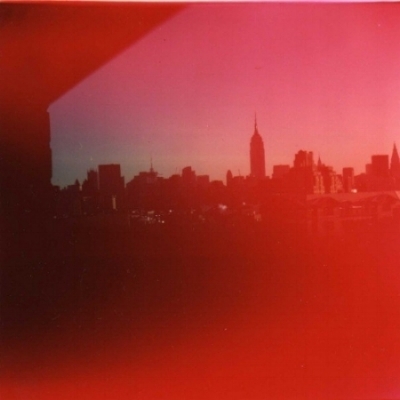 And oh, the pictures: New York was, at the beginning, my most fertile ground for photographs. The place where my love for photography burst into a now-lifelong passion for words. Hours in an East Village darkroom. Sophomoric but evocative pictures of Washington Square Park’s pigeons, before I knew of Masahisa Fukase’s ravens. Trips to Coney Island to photograph with my Canon AE-1 long before discovering Lisette Model or Bruce Silverstein. Walks up and down Broadway with a Russian point-and-shoot before knowing the sublime urbanscapes of Saul Leiter. Walking into the William Eggleston show at the Whitney, years back, and discovering a kindred soul in photographs. New York is the diffuse pink lighting of the bar I tended on Wednesdays, where I learned that Perfect Manhattans are not Manhattans made perfectly. New York was the clairvoyance of the colleague who hand-delivered bars of chocolate and weed in a discreet package to my weekend restaurant job to help me ride the tsunami waves of an unexpected breakup. It is the fine mist of stubborn grease on my clothing and face after flipping sausages and frying fries behind the wooden bar at the East Village German nook where I first loved the idea of “regulars.” It was the recession but thankfully, people still ate wurst. New York: an education for the body and the mind. Learning that winters (at least those of a decade ago) would not be endured in Converse sneakers. Knowing that during a snowstorm that wipes out your subway line, you can find refuge at a lover’s abode. Building up the endurance to read a New Yorker cover to cover. Learning to weather bad haircuts, bad commutes, bad luck. It’s about never doing anything alone. It’s where the subway became the most comfortable place to cry, lonely perhaps but not alone. New York was resisting a therapist for years to avoid being a New Yorker who says, “My therapist says,” and then finding a therapist and becoming exactly that and realizing it’s okay – no, not just okay, but great. For someone not from there, New York is always also about coming and going. Maybe what stimulates the strongest feelings of nostalgia when remembering the city from afar is the knowledge that though it’s still there, it will continue to change at breakneck speed until only the outlines are familiar. And maybe leaving means realizing it’s not the city you’re letting go of but the versions of yourself you were and became during your stay. Paula Kupfer (@stellamaris87) is a writer and editor still somewhat based in New York. She is the former managing editor of Aperture magazine. Her writing has appeared in Surface magazine, on Harper's Postcard blog, BOMB online, Hyperallergic, and the Aperture blog, among others.